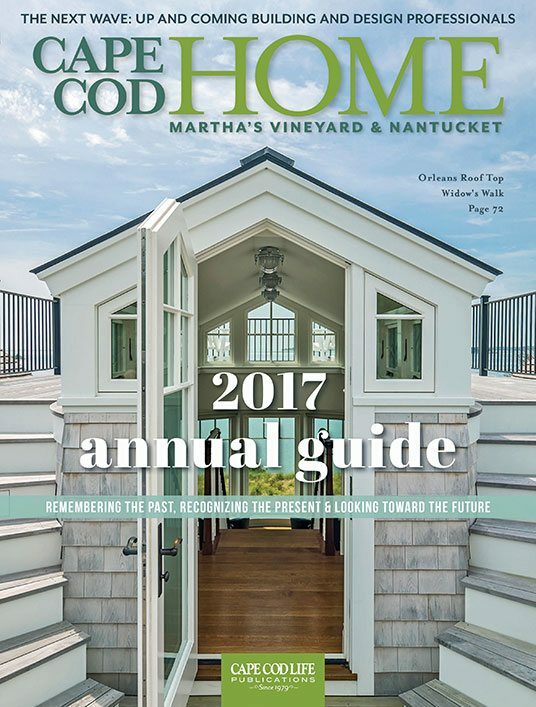 2016 BRICC Awards • Pastiche of Cape Cod, Inc. Anyone familiar with Irina MacPhee, owner of Pastiche of Cape Cod, and her unique powers of transformation, knows that she is a bit of a magician. She understands at her core that a space is not just a space: It is a living, breathing foundation that has the ability to reflect, support and enhance the lives of those that move through it. In 2016 MacPhee was recognized for her metamorphosis of two projects with two gold BRICC awards. This kitchen project was significant for the team at Pastiche, not only for the successful end result of their hard work and divine inspiration, but also because it was the beginning of a beautiful relationship with cabinet manufacturer Jewett Farms. With a long history of working with a vast array of both custom and semi-custom cabinet fabricators, MacPhee has found a partner in Jewett Farms that can accommodate her vision while meeting the changing functional needs found in every project. Given the stunning seaside location of this beautiful home, MacPhee produced a luxurious and sophisticated, yet casual and lively space to entertain friends, family and grandchildren straight from the beach. Leveraging a cool color scheme from a palette of grays, she kept the vibe “soft and serene” while maintaining the warmth the homeowners saught. Perhaps MacPhee’s greatest gift is the balance she achieves with her juxtaposition of surfaces, textures and styles. Wooden, rattan side chairs are softened by linen host and hostess chairs at the grey-washed dining table, while a pewter chandelier oversees the entire gathering. Above the island, oversized hefty steel pendants, which translate as industrial, provide the unexpected counter punch to the classic choice of Cambria quartz that runs throughout the kitchen. Creating a “sense of place” for the active homeowners, while working within a tight budget and an even tighter floor space, MacPhee crafted a beach-inspired destination that transcends the ordinary. To create the color story, choices like deep blue, sand, gray, cream and sepia tones were combined, translating a sense of depth and serenity. Natural materials such as weathered wood stone and linens completed the textural translation for this coastal retreat, while a faux-wood porcelain tile floor provided a worry-free solution for wet, sandy feet. Inspired by vintage bathing costumes that she framed, MacPhee gave the space a personal identity that she complemented with unique lighting choices and eclectic accessories. Overall, in both projects, Irina MacPhee used her magical talents to deftly weave color, texture and pattern into a backdrop that provides a warm welcome home.